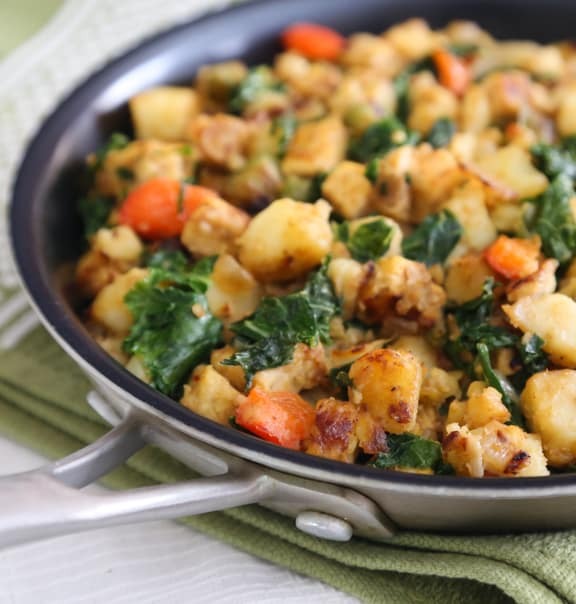 A hearty vegan spin on a “meaty” classic, this skillet hash of potatoes and high-protein tempeh (embellished with bell pepper and kale) is as good served as a quick dinner as it is an offbeat and hearty breakfast. For breakfast or brunch, serve with fruit; add whole-grain bread for a heartier meal. For a quick dinner, serve with an abundant tossed salad, whole grain bread, and orange slices. Photos by Evan Atlas. 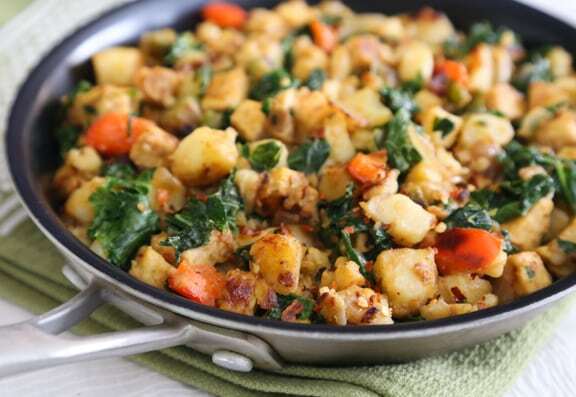 A hearty vegan spin on a “meaty” classic, this skillet hash of potatoes and high-protein tempeh (embellished with bell pepper and kale) is as good served as a quick dinner as it is an offbeat and hearty breakfast. Bake or microwave the potatoes ahead of time until done but still firm. If you'd like to leave the skins on, scrub them well. When cool enough to handle, finely dice them. Heat the oil in a large skillet. Add the onion and sauté over medium heat until translucent. Add the bell pepper, tempeh, and potatoes. Turn the heat up to medium-high, and continue to sauté until all are turning golden brown. Stir frequently. Add the seasonings and kale. Continue to cook, stirring frequently, until the mixture touched with brown spots here and there. If the skillet becomes dry, add a small amount of water, just enough to keep from sticking. Stir in the nutritional yeast if using, and season with salt and pepper. Serve at once; pass around hot sauce for topping individual servings. Explore more of VegKitchen’s Vegan Breakfast Recipes. 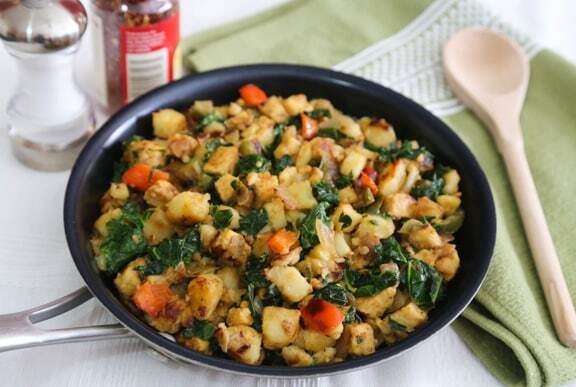 This Skillet Potato and Tempeh hash was delicious. Thank you for the recipe. This recipe never mentions the potatoes after baking and dicing them. When do you add them? Sorry, Kevin. The potatoes are added along with the tempeh — I’ve made the correction. Mare, potatoes tend to get watery when frozen and thawed, so I’m not sure that would be the best idea.